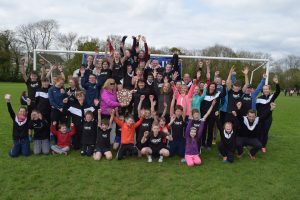 Kilmacow was the destination for athletes from throughout the region as St Senan’s AC held their annual Open Sports Day. This is one of those traditional early Summer meets which should have a preservation order attaching. The running all happens on a grass track; the only synthetic surface is that leading to the long jump sand-pit (and that’s a bit bumpy! ); the shot putt circle is tucked away in a far distant corner; the high jump happens in the basketball court. A little river runs along one side of the track, the same river one uses to wash muddy legs after the annual cross country meet! There’s a tea and tuck shop selling scalding hot strong tea and delicious homemade buns and all sorts of nasty sugary confection for the kids. Everyone, from Bill Lacey at the front gate (and everywhere else!) to the ladies selling the tea and buns to Ned Williams on the megaphone and starter’s whistle, couldn’t be nicer. The net result is that there is a Summer field day vibe to proceedings as opposed to the focus being on do-or-die feats of athletic prowess! One should not, of course, forget the athletics! As with Ferrybank last weekend this was another rewarding trip for Co Wexford clubs. This was especially the case for United Striders AC as they came away with the Best Club Award. Individually there were plenty of noteworthy performances by Model County athletes. The following highlights will give you a flavour of how the day went for them. Young Leah Bolger (Bree) started the Gold rush with a win in the U9 80m. Indeed Bree did v well in the younger age sprints with Shane and Ciara Laffan, Jayden Kenny and Abbie Doyle all medalling. In the Boys U11, Kevin O’Mahoney (DMP) took the bit between the teeth as he led from the gun in both the 80m and 300m to bag himself a pair of Golds. Orla Byrne won the U13 100m. Bree’s Abbie Doyle was settled for Silver in the U12 80m. Talented multi-eventer Saidhbhe Byrne (Enniscorthy AC) won Gold and Bronze respectively in the U14 LJ and 100m; she also placed 3rd in U15 Shot Putt an event won by Taghmon’s Aisling Kelly. Aisling made it a full suite of medals winning Silver in the LJ, behind Maeve Hayes (St Paul’s), and Gold in U15 100m with Ciara O’Connor (EAC) taking 100m Bronze. Jack Forde (St Killian’s AC) won Silver and Bronze in U15 100m and LJ respectively. Dannon Long (Enniscorthy) won the U13 LJ while SBR’s Orlaith Deegan won the U13 HJ. The County had a 1-2-3 in three of the 100m events: Girls U16 – 1st April Keeling (Menapians), 2nd Susie Brennan (Menapians), 3rd Hannah Roche Kelly (Taghmon); Boys U16 – 1st DMP’s Conor Brennan (also 2nd in LJ), 2nd Aaron Browne (US), 3rd David Miodzionowski (US); Boys U17 – 1st Paul Freeman (St Killian’s), 2nd Nic Walkden (US), 3rd Joshua Hewlett (US). Indeed there were 1-2-3s in other events also including the following: Junior Women’s HJ – 1 Rebecca Bowden (US), 2 Ciara Kelly (US), 3 Alannah Byrne (US); Boys U17 700m – 1 Aaron Browne (US), 2 Cian Flanagan (US), 3 Conor Brennan (DMP). Rebecca Bowden also placed 2nd in the sprint. In middle distance events Paul Freeman added to his U17 100m Gold with a win in the 700m. Conor Doyle (Bree) won the U14 700m with Darragh Flannelly taking Bonze. It was a 1-2 in the Junior Men’s 3k with USAC’s Aedan Rogers hauling in and passing Liam Turner (DMP) on the final lap. The final events of the day were the relays. USAC really came in to their own at this point taking 1st and 3rd in the Boys U14 event and 1st and 2nd in the Boys U16. Sinéad O’Reilly, who was pipped for Gold in the U13 700m earlier in the day, produced a super last leg to take her Menapians U14 team into the medals (joint 3rd). Tagged Kilmacow, St Senan's Open Sports, T&F. Bookmark the permalink.